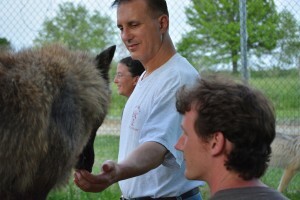 CPT President Mark Spivak, Prof. Gregory Berns, and Dr. Peter Cook, the project leaders of the Emory-CPT Neuroscience Team, in late May, visited Wolf Park in Battleground, Indiana. 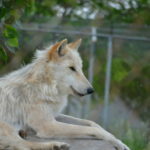 Wolf Park is the country’s foremost facility dedicated to wolf behavioral research, education, and conservation, with the objective of improving the public’s understanding of wolves and the value they provide to our environment. 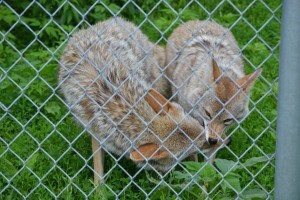 The team was invited to Wolf Park by Prof. Clive Wynne, the Wolf Park Director of Research. Dr. Wynne, a member of the Wolf Park Board of Directors and a noteworthy researcher of dog and wolf behavior and cognition, is a Professor of Psychology at Arizona State University and formerly held a similar position at the University of Florida. 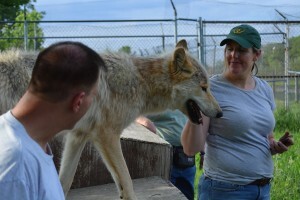 Pat Goodman, Wolf Park’s Senior Wolf Handler, provided a guided tour of the facility, answered numerous questions about wolf behavior, and allowed the team to interact with many of the Park’s wolves and foxes. After the tour and animal interaction, the team met with Dr. Wynne, his post-doctoral assistants, and his PhD students from both Arizona State and the University of Florida to brainstorm research ideas and discuss the potential for collaborative fMRI and behavioral research. The team found the trip enlightening. 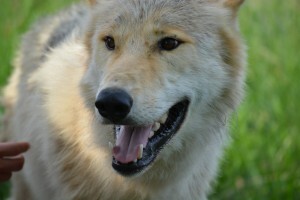 Most saliently, given the selective breeding and the captive environment, the team found that after several generations captive wolves are behaviorally more like domestic dogs than domestic dogs are like wild wolves. Thus, in the opinion of the team, there are more congenital similarities than dissimilarities between wolves (Canis lupus) and domestic dogs (Canis lupus familiaris). Moreover, the environment appears to be a major contributor to each animal’s individual and pack behavior. 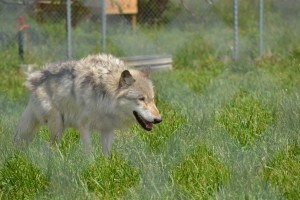 Most conspicuously, captivity modifies the predatory behavior and dominance behavior of the wolves from what they would express if living a wild existence where they maintained a natural pack unaffected by human husbandry and where they hunted for their sustenance, rather than had it placed in their pens by humans. 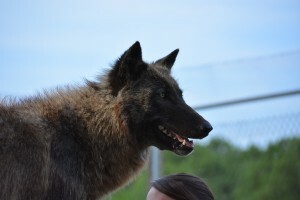 Furthermore, whereas wild wolves are generally very suspicious of humans and tend to avoid human contact, the Wolf Park wolves are tame due to their frequent handling by staff from puppyhood through adulthood. 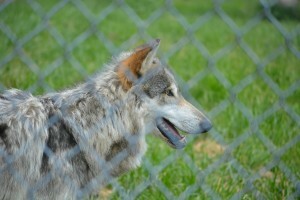 As you will see in some of the photos below, the Wolf Park wolves enjoy contact with the staff and visitors. The photos are courtesy of HP Berns Photography. Note the elongated muzzle of the wolf. 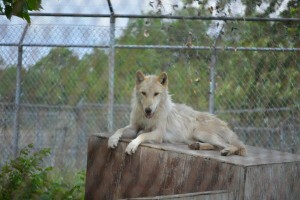 One of the Wolf Park packs. Mark and Peter Cook interacting with Fiona. Mark and Peter pet Fiona. Mark and Erica, a UF researcher, interact with Keilani. 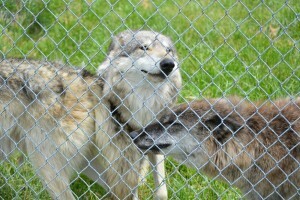 Dana Drenzek, Wolf Park’s Manager, greeting two pack members. 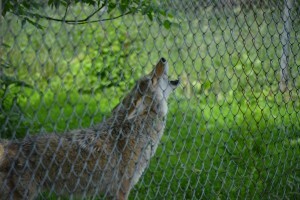 A coyote howling upon the call of Wolf Park Handler Pat Goodman. The Wolf Park coyotes performing ritualized agonistic posturing. 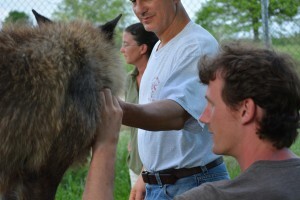 CPT Head Trainer Mark Spivak getting acquainted with a silver fox. 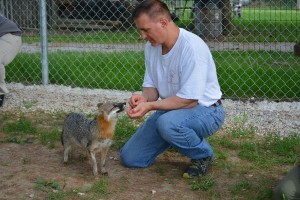 Mark using positive reinforcement to train the fox to sit.